(1) Visit our CME page to learn about great CME from the American Society of Clinical Pathology, ARUP Laboratories, Board Vitals and other sources. CME is posted by date added to the page, as well as by subspecialty. Unfortunately, we are unable to provide CME for reviewing our textbook pages or our Cases of the Week. (2) We have now posted the Pathologist Jobs Report for the fourth quarter of 2015. 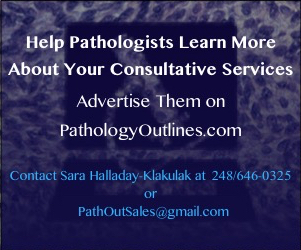 It begins, "For this quarter, there were 138 job postings for full time or part time pathologists at PathologyOutlines.com, which form the basis for the statistics below. This is a 14% increase from the 121 job postings in the third quarter of 2014." Read more. (3) We are starting to add books to our new books database. The advantages of this major change are: (a) all books will have a standard format, (b) books will be searchable by words in the title, any author, year and specialty, (c) changes / errors will be fixed wherever a book appears, (d) there will now only be one static books page, and multiple dynamic pages created when you do a search, (e) our staff will be more productive (once all the books are added), which means we can work on other things! Read more. A 38 year old woman had a jejunal resection with her morbid obesity surgery. 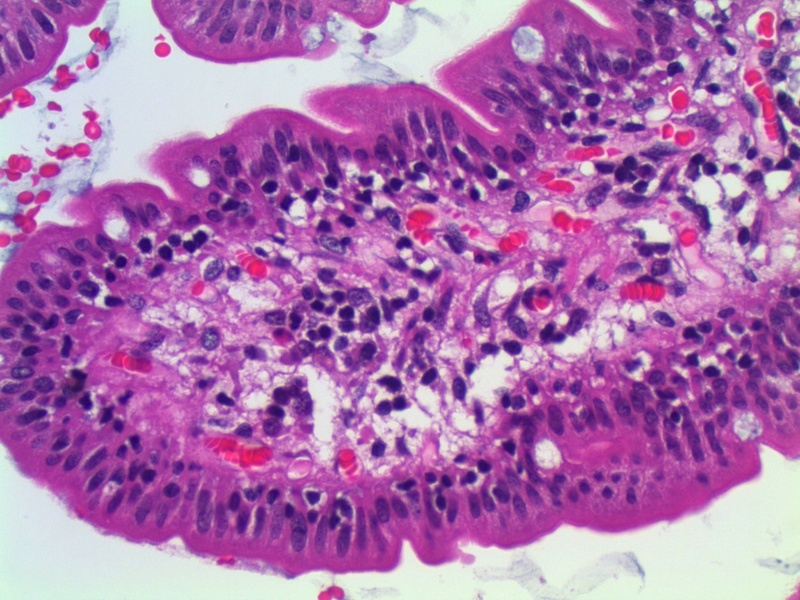 Intraepithelial lymphocytes (IELs) are a normal finding in the small intestinal mucosa, where they play a role in immune surveillance and activation (Arch Pathol Lab Med 2006;130:1020). 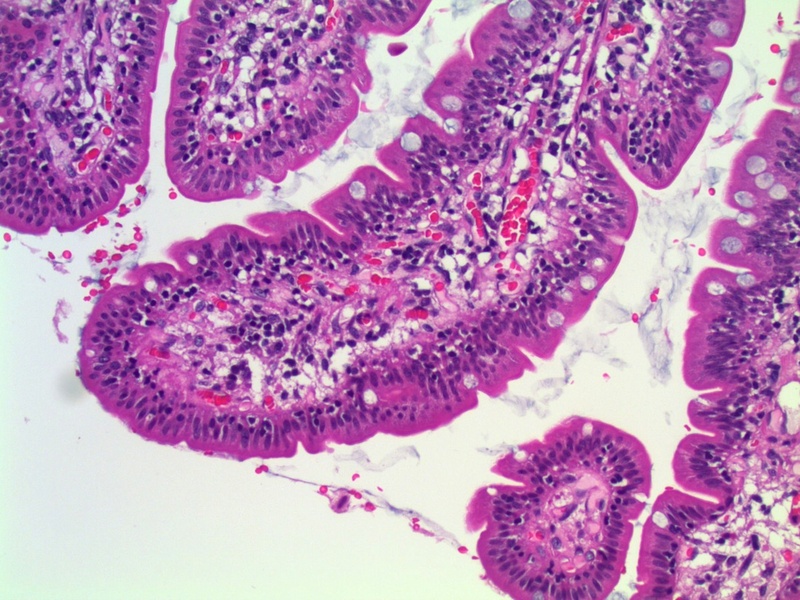 The accepted upper limit of normal has long been considered to be 40 IELs per 100 epithelial cells (Scand J Gastroenterol 2004;39:428), although recent studies have found that, especially in the duodenum, the upper limit of normal is 25 CD3+ IELs per 100 epithelial cells (Arch Pathol Lab Med 2006;130:1020). 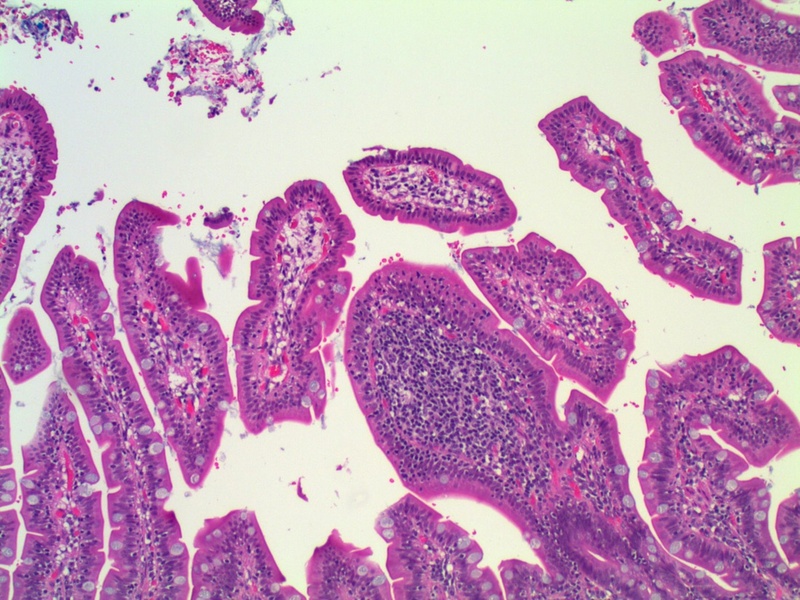 Using this criteria, approximately 1% to 2% of all proximal small intestinal biopsies will show increased IELs with normal villous architecture. 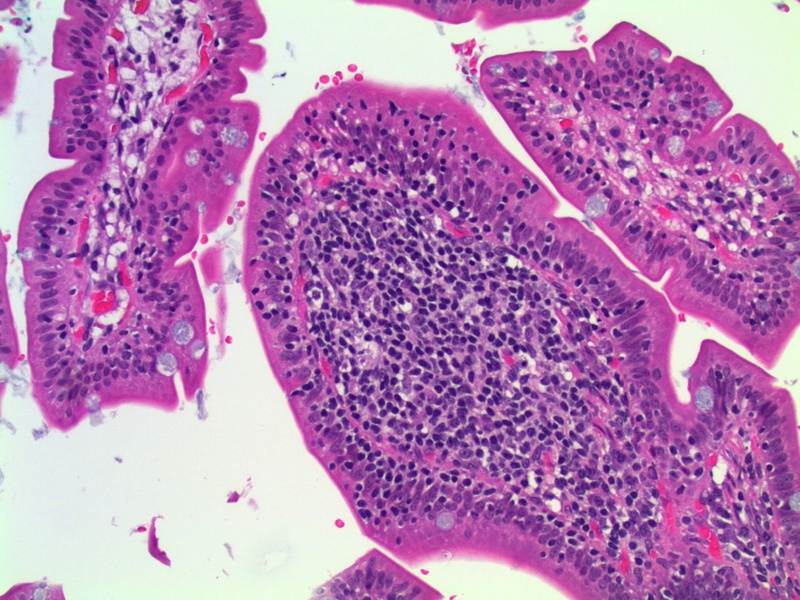 Gluten sensitive enteropathy (GS) with limited morphologic changes is an important cause of this pattern, especially as an increased number of IELs is the earliest pathological change following gluten challenge, and a high IEL count may be the only sign of gluten sensitivity (APMIS 2005;113:385); however, gluten sensitive enteropathy is present in only a small proportion of these cases (Arch Pathol Lab Med 2006;130:1020). 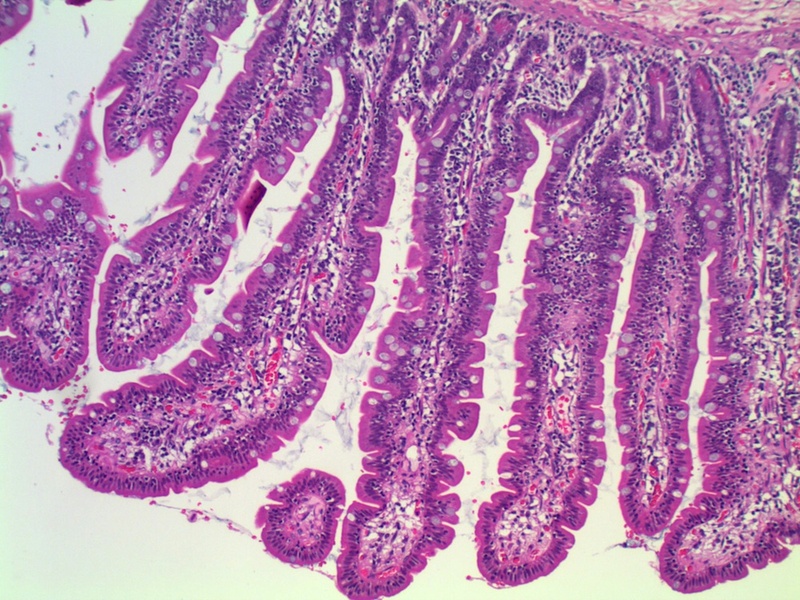 The differential diagnosis of intraepithelial lymphocytosis with normal villous architecture (IELNVA) is broad and includes, in addition to GS, hypersensitivity to other alimentary proteins (cow's milk, soy, fish, rice, chicken), Helicobatcer pylori or other infections (Histopathology 2004;44:199), nonsteroidal anti-inflammatory drugs, immune dysregulation, immune deficiency (eg, common variable immunodeficiency/CVID), inflammatory bowel disease, and lymphocytic and collagenous colitis (Arch Pathol Lab Med 2006;130:1020). Morbid obesity has also been recognized as a potential cause of intraepithelial lymphocytosis (Arch Pathol Lab Med 2007;131:3). In one study, 69% of morbidly obese patients had abnormally high counts of more than 25 lymphocytes per 100 epithelial cells, including 38% with counts of 25 to 40 and 25% with counts more than 60, compared with 27% in the control group, all of whom had counts of 25 to 40 (Arch Pathol Lab Med 2007;131:3). Histopathologic examination of IELNVA shows increased numbers of CD3+ T lymphocytes which are evenly distributed throughout the villi. There is normal villous architecture and normal density and composition of mononuclear inflammatory cells in the lamina propria. The differential diagnosis includes the entities discussed above. Because nearly 10% of cases of IELs with normal villous architecture can be the initial presentation of gluten sensitivity, this should be mentioned in the differential and clinical investigation should follow (Am J Gastroenterol 2003;98:2027). Prognosis depends on the underlying etiology; therefore, effective communication by the pathologist with the clinical team is essential in order to ensure appropriate clinical follow-up and investigation.